You can get the Canon G7X Mk II at Amazon or B&H. Using those links costs you nothing and helps me keep this site online. Thanks! Since the advent of consumer digital photography back in the early 2000s, I’ve always had a Canon Powershot camera. Over the years, I’ve gone from a 3-megapixel brick of a shooter, to (for the time) ultra-tiny cameras, to modern large-sensor powerhouses. Smartphones and iPhones are now incredibly powerful, so there’s no real reason for consumers to be carrying around pocket cameras for pictures of friends and family. Smartphones often easily outclass digital cameras with far bigger sensors due to the amazing computational image processing tech from the geniuses at Google and Apple. But even in 2017, there is still a place for a great pocket digital camera. When traveling, I want to move around with the smallest camera package possible that gives me high-quality raw images. I also like to have a camera that can travel with me in my everyday bag that I can pull out as needed. Up until recently, that’s been my S110, but as it’s gotten older I’ve had my eye out for something better. I also often carry around a huge DSLR as a backup when shooting film, and I’ve always fantasized about replacing it with something lighter that could do the same thing. So I picked up the Canon G7X Mk II with high hopes and big plans. I took it on a trip across Europe recently as my only camera companion besides my iPhone 6 Plus. So how did it do? Did I miss having a much heavier DSLR with me? Long story short, hardly at all. The Canon G7X Mk II is an incredible camera. I was able to coax a few decent pictures out of the S110, but the G7X II regularly created images that are indistinguishable from my DSLRs. There are certainly cases where a DSLR is far superior, and I’m definitely still using one for critical pro work. However, for causal photography the lightness and power of the G7X Mk II makes for a compelling package. The lens is easily the most impressive part of the G7X Mk II package. The larger a sensor gets, the larger and more complex the corresponding lens has to be. Canon manages to cram an excellent zoom lens into this camera without taking hardly any more space than cameras with much smaller sensors. The lens has a 35mm equivalent range of 24mm-100mm, with an aperture of f1.8-2.8, which is superior to both the smaller G9X and Sony’s RX100 series. It’s one of the reasons I went with this camera, and I’m extremely impressed with the engineering that went into it. 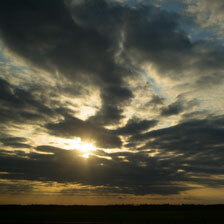 I wish a had a lens with this good of a focal range and aperture for my SLR cameras. One thing to note is that because of the insane precision that goes into these kinds of lenses, there will be variation between individual cameras. This is true with all larger-sensor pocket cameras including the Sony RX100 line. Some focal lengths will be softer than others, and some parts of the frame may be softer than others, and it will be completely different than somebody else’s G7X Mk II. I recommend testing the camera out when you get it to make sure you’re happy with your particular camera’s sharpness. The button layout on the back will be familiar to any user of Powershots, but it’s often just as easy to use the touchscreen. Autofocus is this camera’s biggest weakness (other than poor jpeg processing, which doesn’t bother me since I only shoot in raw with this camera). It’s not that the autofocus is bad, it’s just that the lens is so good, and depth of field is so shallow, that the old school point-and-shoot autofocus system just can’t keep up. Older cameras had smaller sensors and with it a deep depth-of-field, so it was rarely as much of a problem. The touchscreen on the back makes it relatively painless to select a focus area, but the camera will often struggle to hit exactly what you’re trying to focus on, or will miss just enough to throw it slightly out of focus. This is likely why, when left to its own devices, the camera will aggressively raise ISO before opening the lens all the way. Wide open, the camera can take beautiful images with very low grain even in low light, but focus is going to be be a problem. Manual focus is there, but like on any point-and-shoot, it’s fairly difficult to use. I have found it handy for locking focus on infinity, but it’s slow to set up and handle, even with the lens ring set to adjust focus. The exposure dial on the top of the camera is incredibly helpful. I wish my DSLRs had one. Exposure is fairly solid with this little camera, and I’ve found it to be easy to quickly adjust when necessary with the compensation dial. In fact, I wish DSLRs had an exposure compensation dial this convenient to use. This camera does not have a viewfinder, unlike some more expensive point-and-shoots and mirrorless digital cameras. However, the brightness of the LCD can be adjusted to be bright enough to be easily seen even in bright daylight. However, there is no auto-brightness setting, so you’re going to have to adjust the LCD manually, which is a bit of a pain. 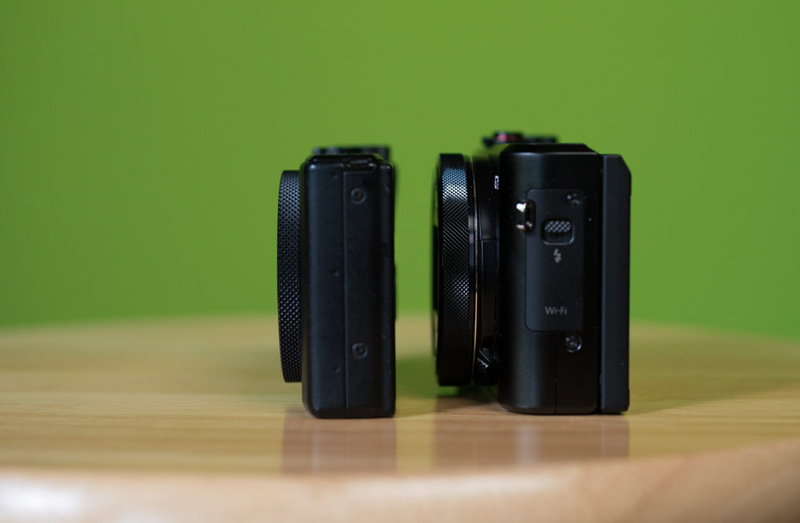 A side view shows that the G7X Mk II is a bit on the thicker side compared to a S110. This camera is just a hair too big to be pocketable. My S110 just barely fit into my back pocket, but it fit. The G7X II fits, but it’s an ordeal getting it in and out. A large jacket pocket or cargo pants will easily hold it, but I’m not always wearing a jacket (and never cargo pants). It’s still far, far smaller and lighter than a comparable DSLR rig though. I could never stow a DSLR easily in my everyday bag, but this camera goes in the front pocket without a complaint. 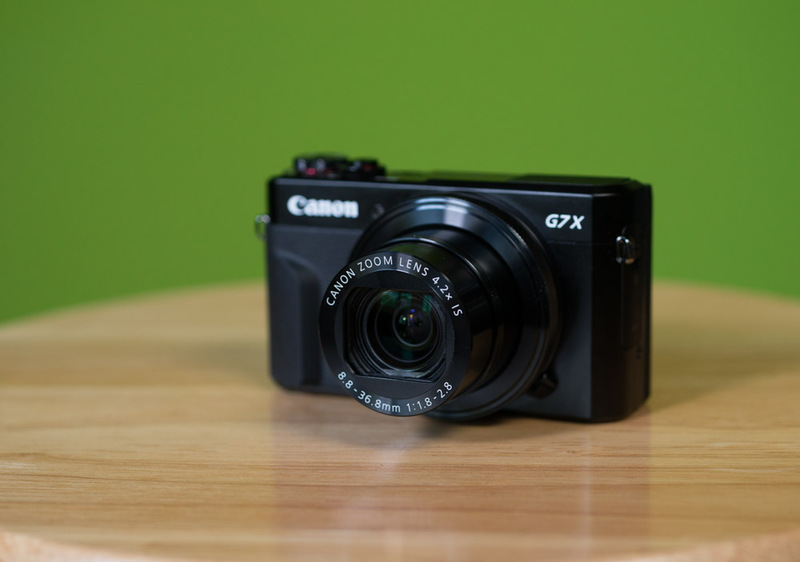 If Canon can get this camera just a bit smaller, down to the size of the S110/G9X, they would have created quite possibly the greatest pocket camera ever built. Otherwise, there is an embarrassment of riches when it comes to buttons and knobs. There are multiple programmable dials and switches, and a dedicated ring to exposure adjustment. A small grip on the front makes it easy to hold, and almost everything can be adjusted to your preferences. Some of the touchscreen controls can be a tad confusing to navigate, but once you get the hang of it, you can fly through the settings on this camera just as fast as on a quality DSLR. 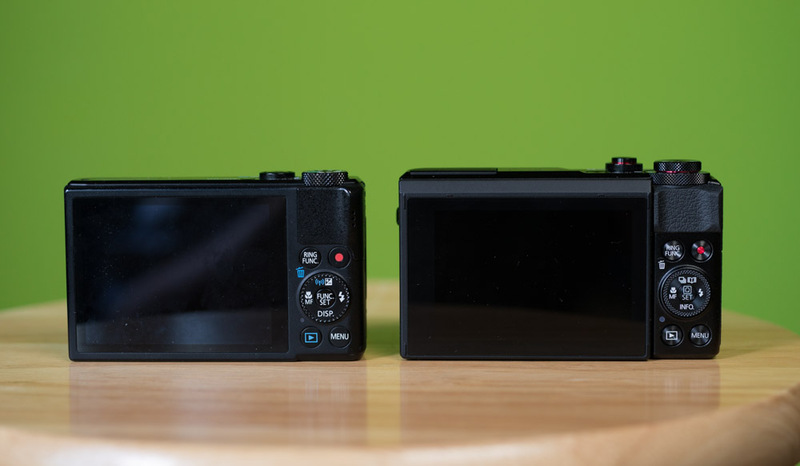 Other than thickness, the G7X II is similar in size to the S110. I always worry about collapsing lenses and the ultra-delicate glass inside, and this camera is no exception. Happily, it seems fairly robust, and Canon has been doing this for a long time. The lens cover stays fairly solidly shut, and is hard to jostle open. The folding screen on the back is the only cause for concern in this package. The screen itself seems to be pretty tough, having not gotten scratched with somewhat rough treatment that I’ve put it through. However, there’s an exposed ribbon cable that worries me a bit. I worry about the battery/card door lasting for a long time without getting lose. Like the ribbon cable, only time will tell if this is a problem. Finally, the glass cover on the back screen is on par with modern smartphones for durability. I’ve been very happy with it and haven’t worried about scratching it. You won’t need to get a screen protector. Surprisingly, the JPEGs I’ve gotten out of this camera look terrible. The images are over-sharpened, and the grain processing is unpleasant. This is the main reason I would recommend using an iPhone for pictures of friends over this camera any day. You’re not going to want to process a bunch of raw files for some fun party photos. However, the raw images from the camera do look great, and grain is very low at the lowest ISOs. I’ve gotten the best results by turning auto-iso off, and forcing the camera to open the aperture when it needs more light. Pictures taken below 400 ISO look great, and grain is reasonable above but increases quickly. For some reason the camera by default will shoot the iso up to 800 and above needlessly when using auto-ISO. The sensor sensitivity should be the last thing upped, especially when the lens’ f-stop can easily go wider. A bit of softness from the lens being wide open is much more pleasing than an ultra-grainy image. The sensor on this thing is fantastic for the size camera its in. However, one major weakness is pixel bleeding in portions of the image where there is high contrast. White on black looks particularly egregious, as the white spills into the black, causing the image to look soft. This was a much bigger problem on the S110, so it’s still an improvement here. However, smartphone manufacturers have gotten deviously good at reducing this effect on even tinier sensors, so I’d like to see more work done here in the future. From other reviews, I was slightly concerned with battery life on my G7X Mk II, but I needn’t have been. I even went as far to purchase a second battery for my trip to Europe, as I was afraid the camera wouldn’t last a whole day of shooting. However, I never needed it. Shooting heavily for an entire day on one battery charge is no problem, and I never had the camera die on me. If you’re on an extended hike and won’t be able to charge for days, a second battery might be a good idea, but otherwise one should be fine for most people. The batteries are small and lightweight, so putting an extra one in your pocket for peace of mind is no bother. One of those ‘I can’t believe we’re only now getting around to this’ features on this camera that I very much appreciate is the ability to charge by simply plugging the camera into a common micro-usb charger without taking the battery out. You can still pop the battery into a dedicated charger, but this flexibility is much appreciated. If only it was usb-c. Maybe next time? S110 on the left, G7X II on the right. Sony makes what many consider the best ‘pocket-pro’ cameras out there with the consistently iterated RX100 line. These cameras, however, are significantly more expensive than the G7. As of 2017, only the Mk III variant and below are competitively priced. The more expensive Sony RX100 cameras have a viewfinder, which is a huge help outdoors. Also, Sony is a much better option for video, especially the V model which features s-log. 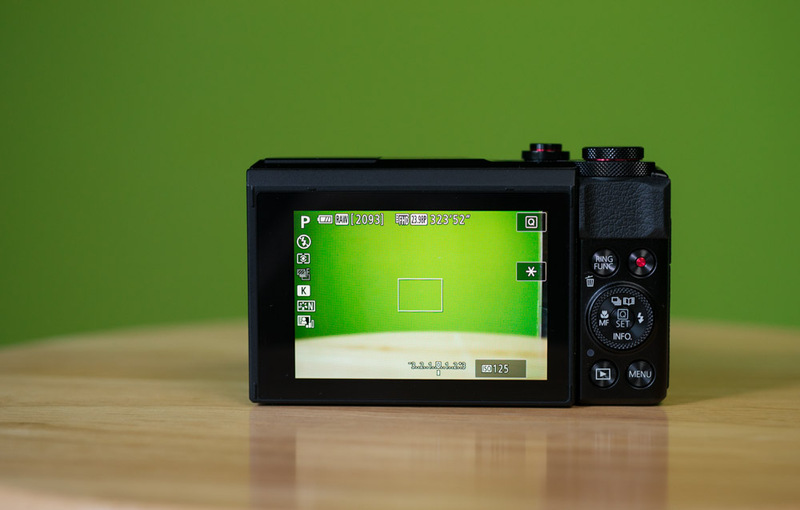 If you’re a videographer, the Sony RX100 V is an incredible camera. On the other hand, the RX100s don’t have a touchscreen, which can make it difficult to select focus, and the lens range is slightly smaller and has a smaller aperture throughout much of its range. It’s a tough call, but both are great options. If you’re shooting JPEGs, the G7X II is not for you. The JPEG processing on this camera is far worse than what can be achieved with most high-end smartphones out there, including the iPhone. Modern smartphone cameras are so good, there’s really no reason to carry a pocket camera unless you’re shooting at a level that requires raw images. It’s amazing to me that iPhone processing tech is so good that a minuscule sensor can produce a better image than a much larger sensor. And this is Canon we’re talking about, not some no-name company! I haven’t used this camera personally, but I’ve read enough negative reviews that I wouldn’t recommend the camera. Primary complaints are a lack of speed and difficult handling. 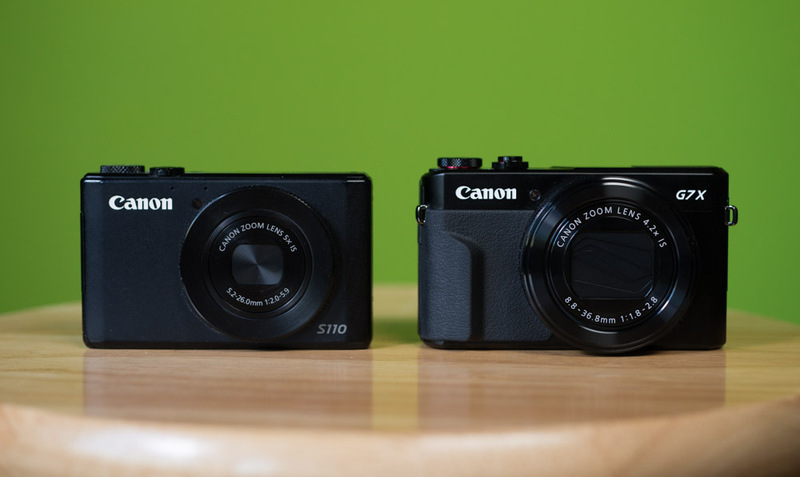 The G9X Mk II is much closer in size and price to the venerable S110 that I was replacing, and is actually pocketable. Since it has the same sensor and processor as the G7X II, I was extremely tempted to get this camera, but ultimately decided not to go with it because of the lens. 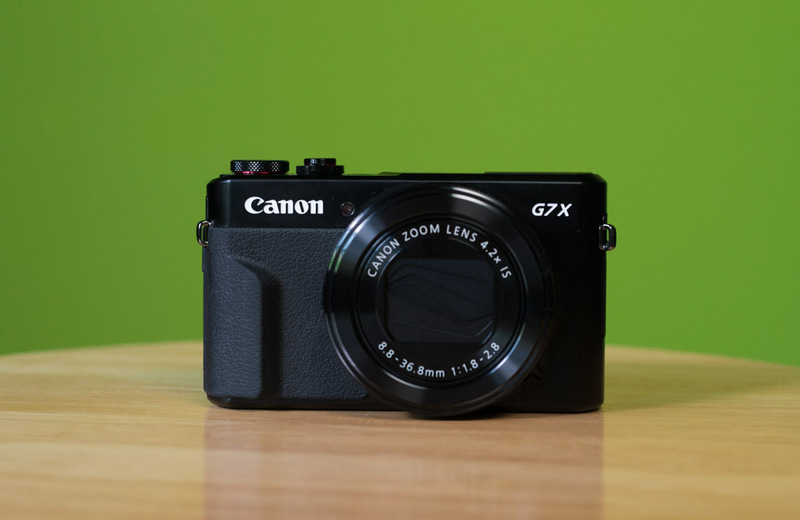 Because it has a larger sensor jammed into a smaller body, the G9X lens has a smaller zoom range and much smaller aperture than G7X II. Also, it lacks many buttons and manual controls, relying almost entirely on the touch screen. Since my favorite part of the G7X II is the amazing lens, I’m glad I spent the extra money for it, but I really miss being able to stow the camera in my back pocket. 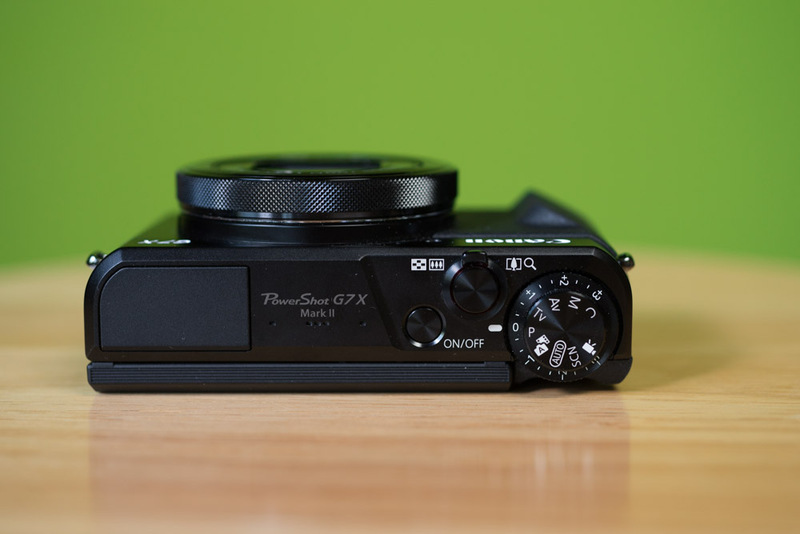 If portability is your main concern, the G9X Mk II might be your best bet. 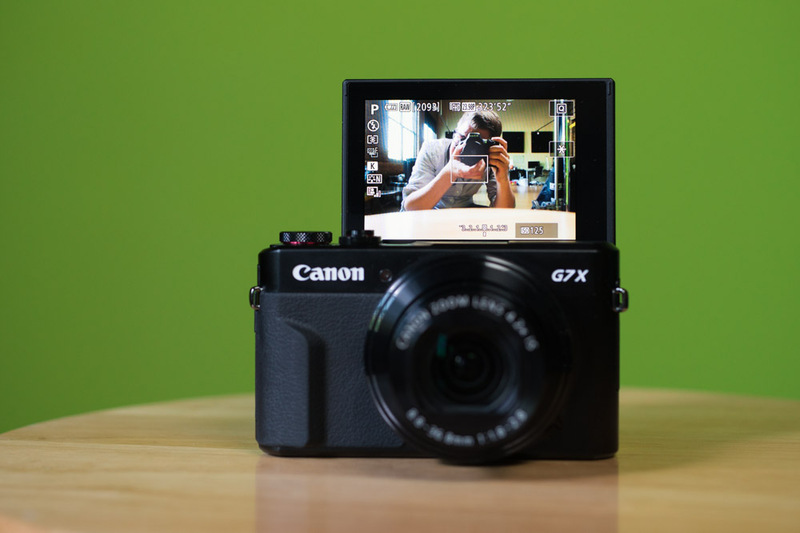 If you want a light, largely no-compromise digital shooter, it doesn’t get much better than the Canon G7X Mk II at this price point. If macro is important, you’re still going to have to haul around a full DSLR, as the autofocus system isn’t up to the challenge of critical focus. However, for landscapes, travel, and an all-purpose digital raw companion, I have few reservations about recommending this camera.